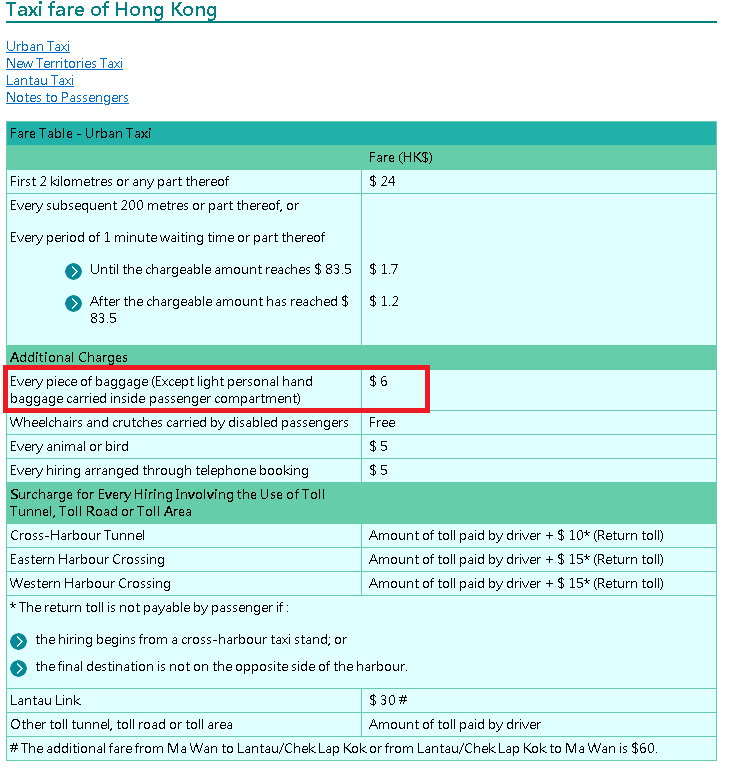 https://www.td.gov.hk/en/transport_in_hong_kong/public_transport/taxi/taxi_fare_of_hong_kong/index.html (mirror) indicates that "Every piece of baggage (Except light personal hand baggage carried inside passenger compartment)" is charged 6 HKD charge when taking a taxi in Hong Kong. What qualifies as a "light personal hand baggage carried inside passenger compartment"? E.g., does the regulation give any concrete numbers of the maximum dimension or weight for a baggage to qualify as a light personal hand baggage? The official criteria for chargeable luggage carried in the passenger compartment is linear dimension (length + width + height) greater than 140 cm. Baggage charge may be levied on every piece of baggage that is carried inside the luggage compartment, and every piece of baggage with total dimensions ( length + width + height ) exceeding 140 cm that is carried inside the passenger compartment. The dimensions of baggage should be calculated based on the measurements at the time when they are put into the taxi. Baby carriages are also subject to additional charges for baggage according to the above guidelines. The luggage must also be able to be safely secured inside the passenger compartment and not damage the vehicle. Of course, taxi drivers aren't going to routinely use a tape measure on all bags, so I think jpatokal's "looks like a carry-on" is effectively what happens unless you dispute it. At the end of the day it's at the taxi driver's discretion (edit: oops, apparently there's an official limit, see the other answer) but a reasonable rule of thumb is does it fit in an airplane's overhead compartment? If yes, it's probably OK; if not, it almost certainly has to go in the back. Another option is to use Uber, which is quite popular in Hong Kong and is not only (usually) cheaper than taxis, but does not charge for extra baggage. Not the answer you're looking for? Browse other questions tagged luggage hand-luggage hong-kong taxis fares or ask your own question. When should we arrive at the terminal for the ferry from Hong Kong to Macau?